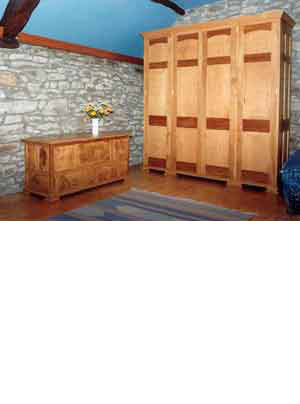 Bedroom - Waring and Woodfellows: Furniture design and makers of bespoke, quality furniture and buildings, cabinet makers, master carpenters building bespoke doors, windows, kitchens, staircases in Lampeter, Ceredigion, West Wales, UK. 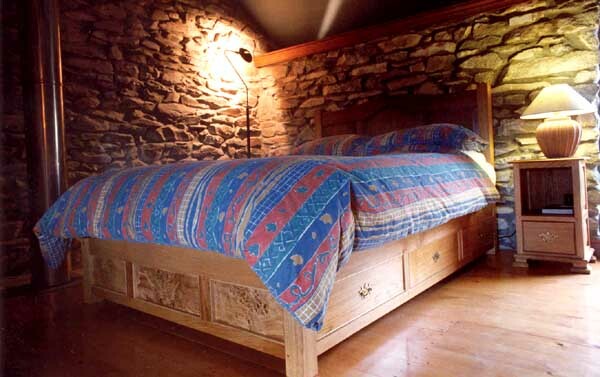 The oak bedroom was designed for a spacious, but low-eaved farmhouse bedroom. The horizontal rails on the wardrobe doors, ends (and back) were made of brown oad to emphasise the horizontal lines of this large piece and thus reduces its apparent height. All of the timber used in this project was brought down in the 1988 gales. Fittings are solid cast brass. The finish was achieved by oiling and hand-waxing. The commission was completed in 1993. he pitch pine box sash windows and mouldings were also produced in Woodfellow's workshop. Drawer Chest: The linen chest has brown oak return rails at its ends while the drawer fronts show the slivery figuring of quarter-sawn oak. Burr Oak Chest: The linen chest has its panels and drawer fronts in burr oak with brown oad in selected framing rails.